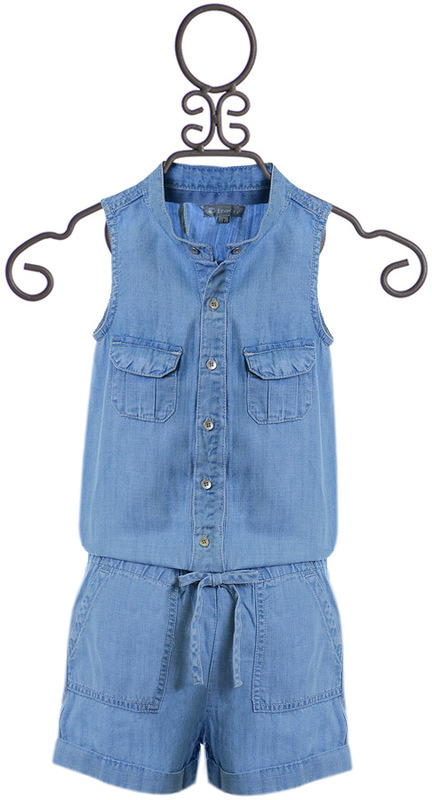 $24.5 - Hitting two fabulous trends in the same design, this tween romper is perfect in denim and comes from Tractr. A soft V neckline meets at the start of a line of silver buttons found in the center. Two box pleat flap pockets are found on the bodice while larger pockets on the shorts just just beneath. The stretch waistline has a denim bow while the cuff hem finishes off the look. 100% "Tencel" Lycocell. Machine Wash Cold, Tumble Dry Low. SIZE 7 AND 10 REMAINING.